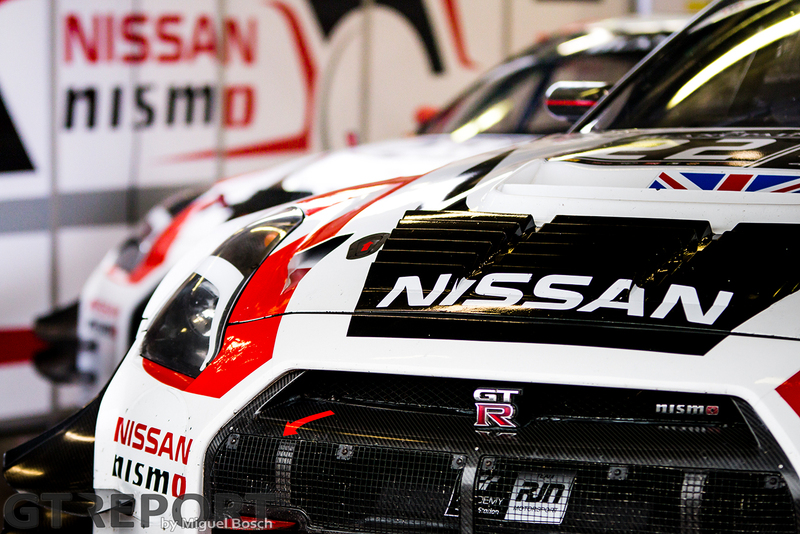 The Nissan GT-R Nismo GT3 is an anomaly of a supercar. Not recognised with all the glamour and flair of the Ferraris, Lamborghinis, McLarens and Porsches of the world, it is a car that has grittily carved a revered reputation among a wide range of motoring enthusiasts by shunning prestige and instead being a pure tool of performance that is backed up firmly by its race results and championships. While its DNA is traditionally an all-wheel-drive, turbo-six platform; some of the greatest GT-Rs have been the pure racing specials which demonstrate the versatility of the platform. For example; the great R33 Le Mans GT1 entries of 1995 and the 2011 FIA GT1 winning V8 powered R35 cars – both were RWD! So, when Nissan decided to properly throw its hat into the fast-growing GT3 ring in 2012, it made many people salivate at the thought of yet another potent race focused GT-R taking on Europe’s best. 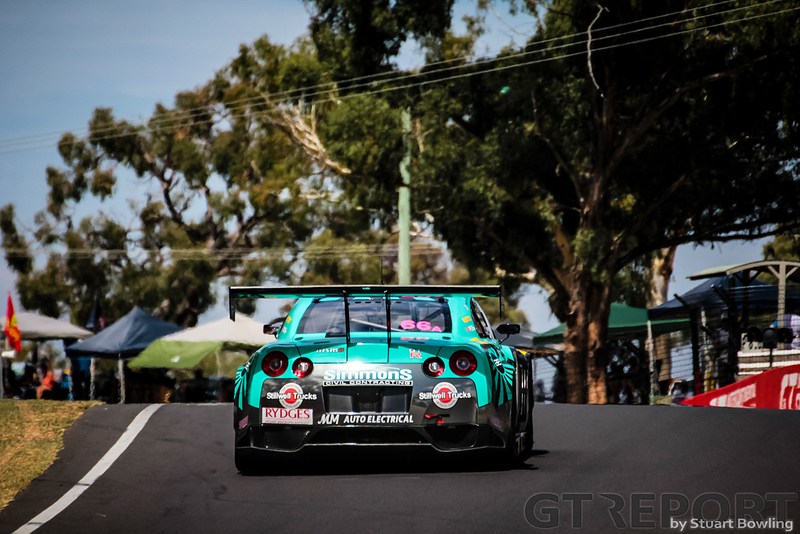 Nissan’s commitment was rewarded after only three years, with the GT-R GT3 netting some big results – winning the 2015 Bathurst 12 Hour and the Blancpain Endurance Series. The cars cult-like popularity escalated further – and its entry alone was enough to draw in bigger crowds. 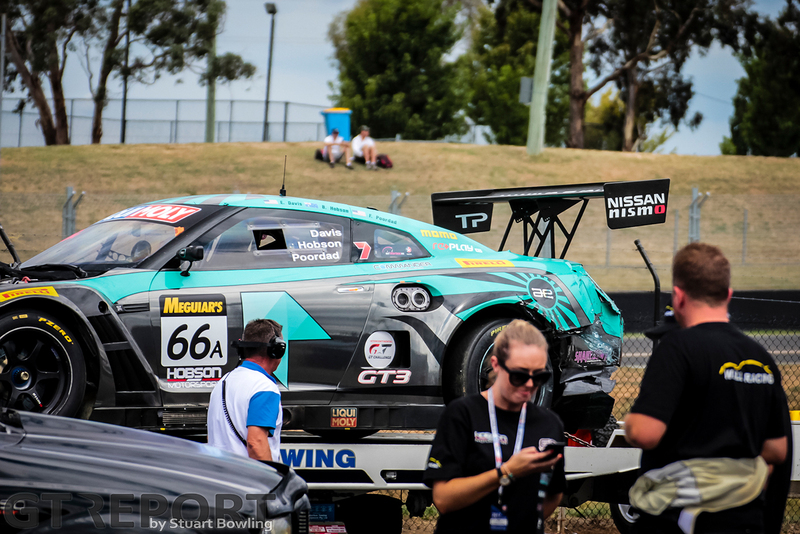 During the 2017 Liqui Moly Bathurst 12 Hour I was given the privilege of being able to visit the garage of small privateer team Hobson Motorsport and get a detailed look at their pair of 2014-specification Nissan GT-R GT3s. Their cars were acquired from Always Evolving/AIM Autosport, who had previously used them in the US based Pirelli World Challenge series through 2015 and 2016 to good effect with several race wins. Helping them run the cars over the weekend were Wall Racing, an outfit from Sydney, Australia. Before the race weekend had even started, all concerned had pulled off a remarkable effort to get the cars over to Australia by container ship from the US, shaken down and race prepped in only a few weeks. Further augmenting the effort were AIM staff, with Hobson hiring an engineer, Balance of Performance specialist to extract the most out of the cars boost limits, and a senior mechanic to provide an injection of experience and knowledge. 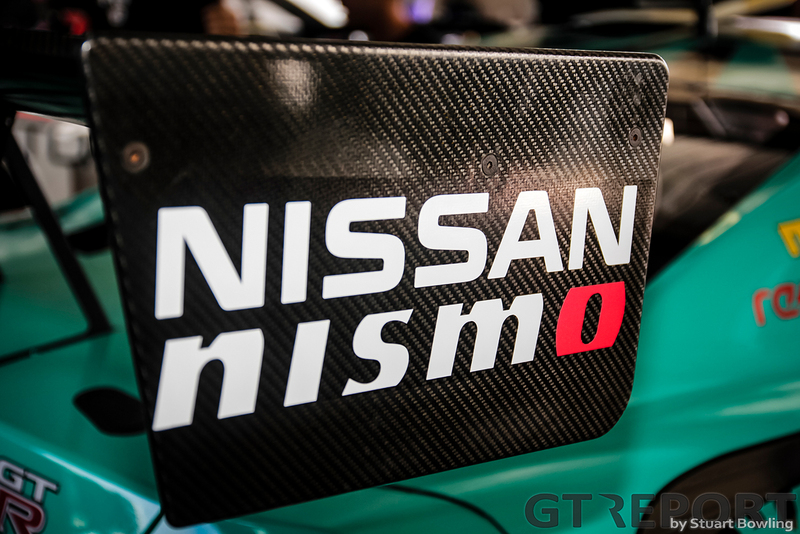 Only a few pit bays down lived the factory run Nissan Australia effort with a pair of 2016 specification GT-R GT3 (based on the heavily revised 2015 model update). Slick and well resourced, this was a doubling of efforts over previous years; a sign of Nissan’s desire to win again at a circuit that has helped elevate the GT-R into rev-head folklore. 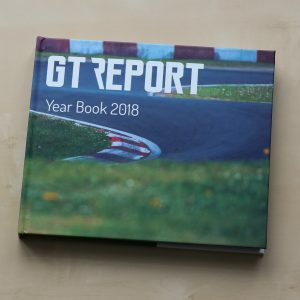 The 2017 race provided a rare opportunity of having two iterations of GT-R GT3 competing at the same event, which allowed me to assess the similarities and differences of the package at various stages of its evolution and understand what has influenced its design. When directly compared to other lithe and exotic GT3 machinery that sit up and down the pit lane, it is obvious that the GT-R GT3 is a large beast of a car. You’d be deceived into thinking its large size must give it some form of deficit to its opponents, but its abilities bely its dimensions. 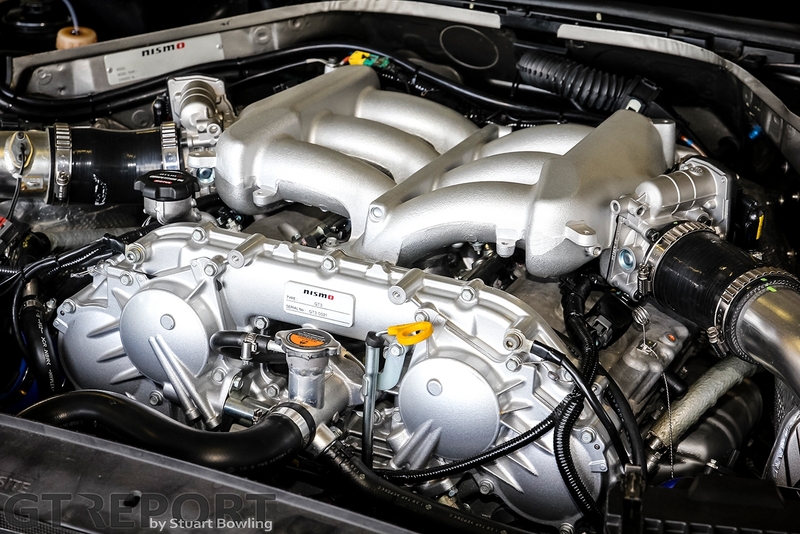 This is not by accident; every part of the car is honed for exceptional performance with JRM providing a very high quality build, as expected to get Nissan’s factory blessing. Every fully FIA homologated GT3 car must begin life from road car stock; namely the base chassis and engine. 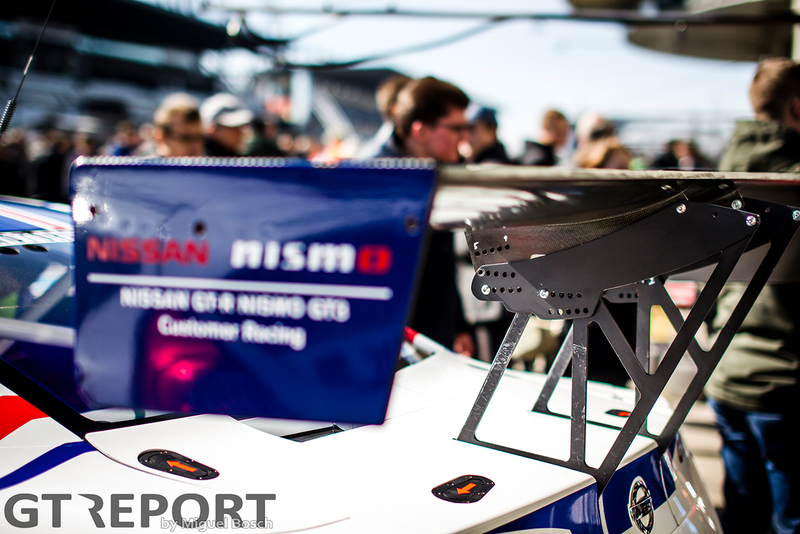 In the case of the GT-R, JRM works over the body shell and Nismo Japan heads up development of the race engine. JRM begins with a bare chassis straight from Nissan, and although it is already a cutting-edge performance item it undergoes extensive modifications. At the start the build process a significant amount of the chassis is cut away; notably some exterior panelling including the roof, and some of the floor to provide access the transmission. 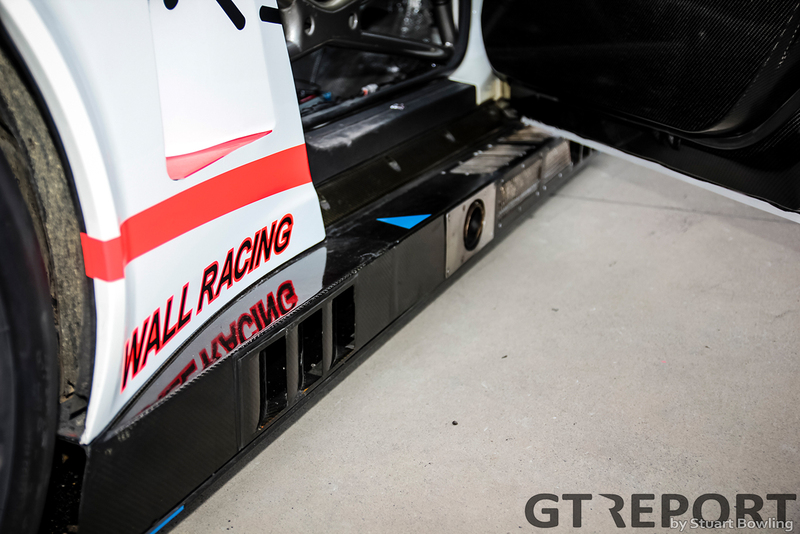 Chassis rails, suspension turrets, firewall, door sills and most of the floor pan are left in place as is required by the GT3 rulebook. The race-winning mission of the GT-R GT3 means it is also put on a diet to remove a fair chunk of its road going weight. For starters, the race car is now reskinned in full carbon fibre bodywork with aggressively widened wheel arches added to fit the cars now much wider stance, courtesy of fitting of race rubber. The doors, bonnet and boot lid are also tossed away and replaced with full carbon items. Glass windows are replaced with light weight race plastics and extra parts are thrown in the bin. 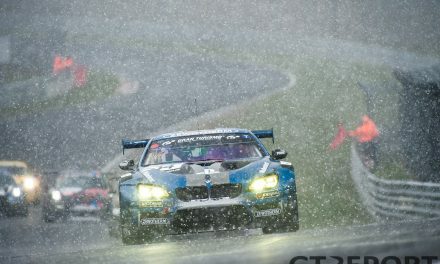 For instance, the GT3’s rain duties are now handled by a single wiper blade. 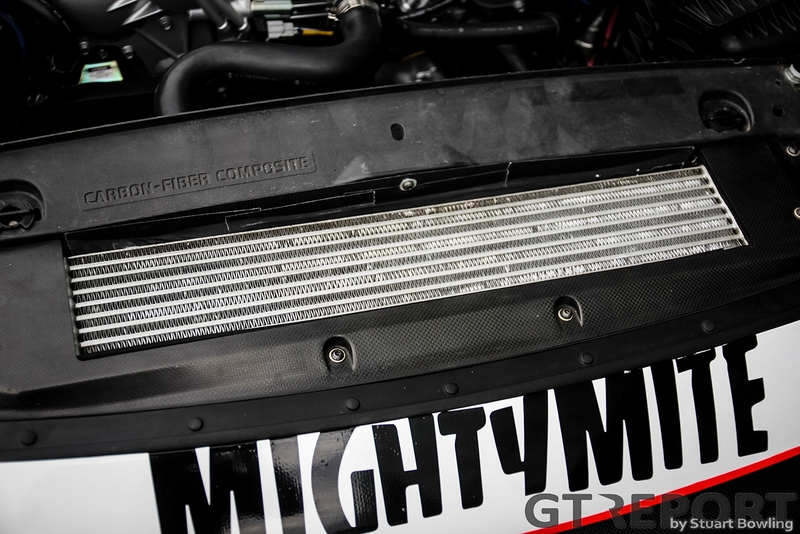 After close scrutiny, it appears that not a single part of the cars road going interior trim ever makes it into the race build – all in the name of weight loss. After every change on the GT-R GT3 is said and done it weighs around 1300 kg, a fair way down from the 1730 kg road car. 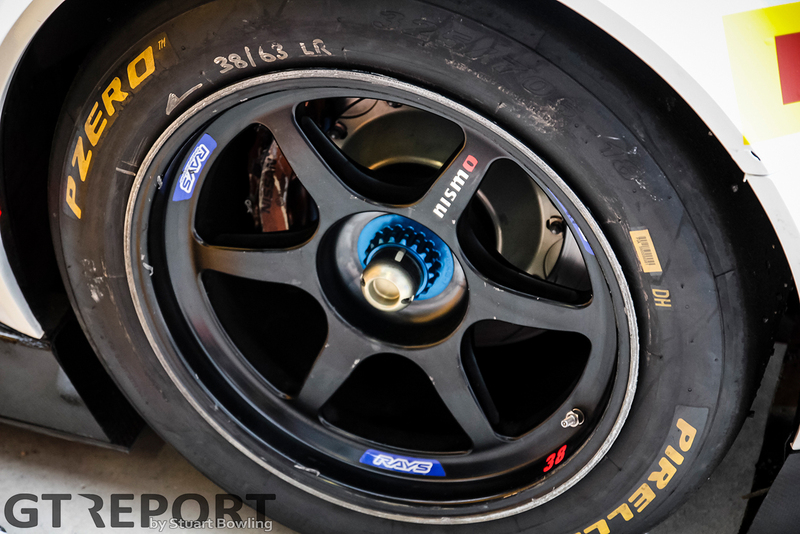 The GT-R GT3 rolls on one size tyre on all four corners: 325-705-18. 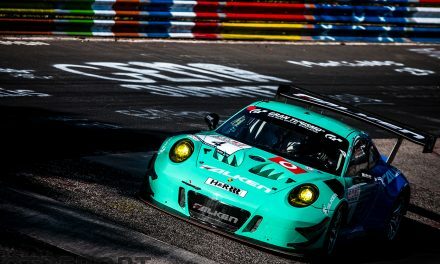 This size is unique among GT3 cars, particularly with its tall sidewalls. This rubber is mounted to a very distinctive set of Rays Engineering created 6 spoke centre lock race wheels – 18” in diameter as mandated by the GT3 regulation. The result is a very light rotating mass, with a JDM look that most GT-R fans will appreciate. 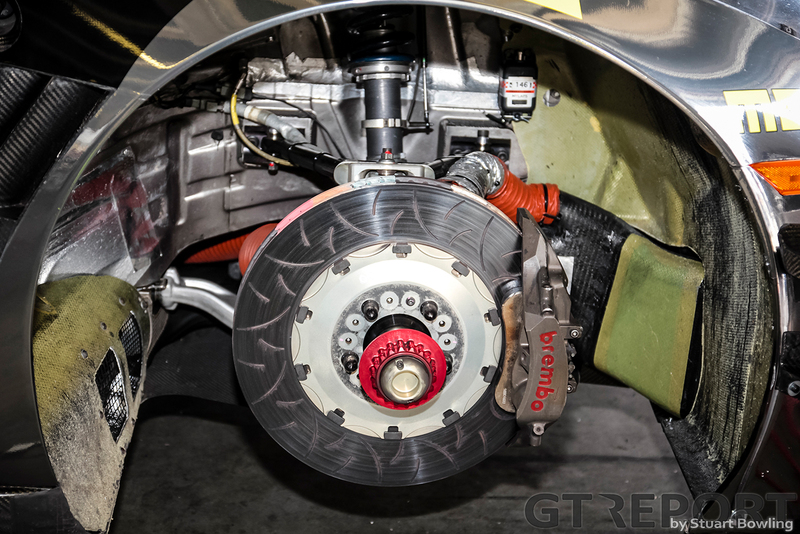 Within the wheels of the 2012 to 2014 spec cars are a set of Brembo racing brakes; GT3 specific six piston callipers out the front and the original GT-R road cars four pistons at the rear. From the 2015 model onward, these changed to AP Racing on all corners (although AP Racing and Brembo are essentially the same brand). 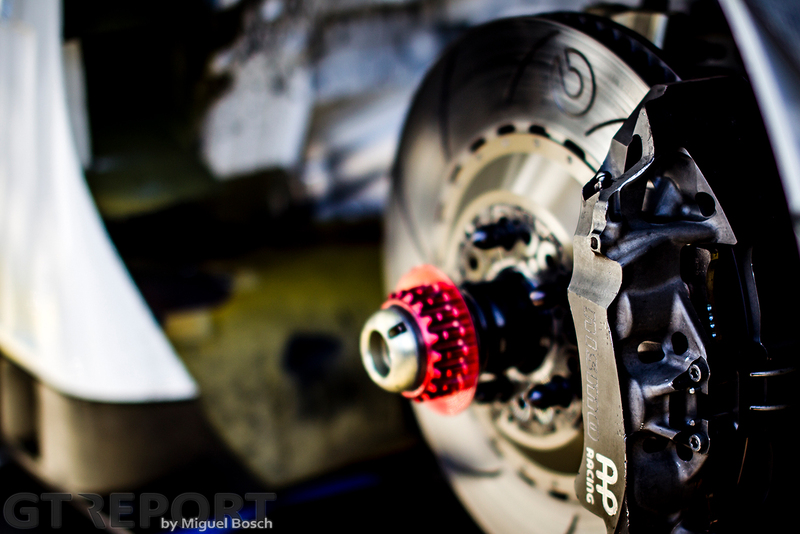 These provide plenty of consistent stopping power for the car which is on the upper end of GT3 weights. 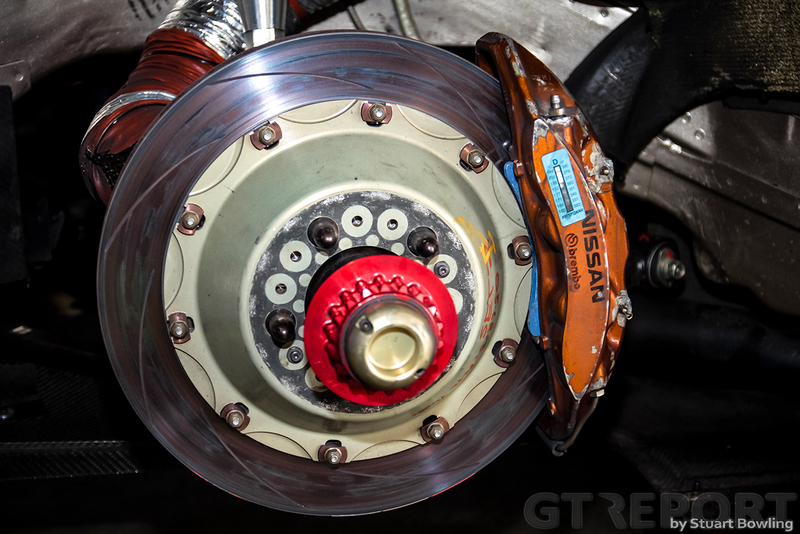 As per the GT3 regulations, supposedly implemented to keep costs down, the brake discs are all made from steel and in the case of the GT-R GT3 they are slotted, not drilled. 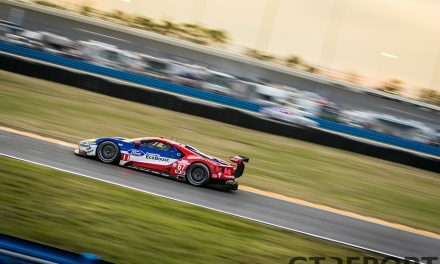 Cooling of the brakes is mostly provided by ducts that take fresh air directly from either the front grille or rear quarter panel vent and direct its flow to the inner arch where it is split across the rotor for maximum effect. To keep the rubber glued to the ground, the big Nissan relies on Öhlins TTX four-way adjustable dampers front and back – still pinned to the original turrets but reinforced by structural bracing within the engine bay for improved chassis stiffness. The GT-R GT3 still utilises the famous VR38DET Twin Turbo V6 engine from its road-going sibling. As with everything else on the car it under goes a little bit of work to help it live with the strains of a racing life. New internals such as race specific camshafts are installed and a dry sump lubrication package is also added. 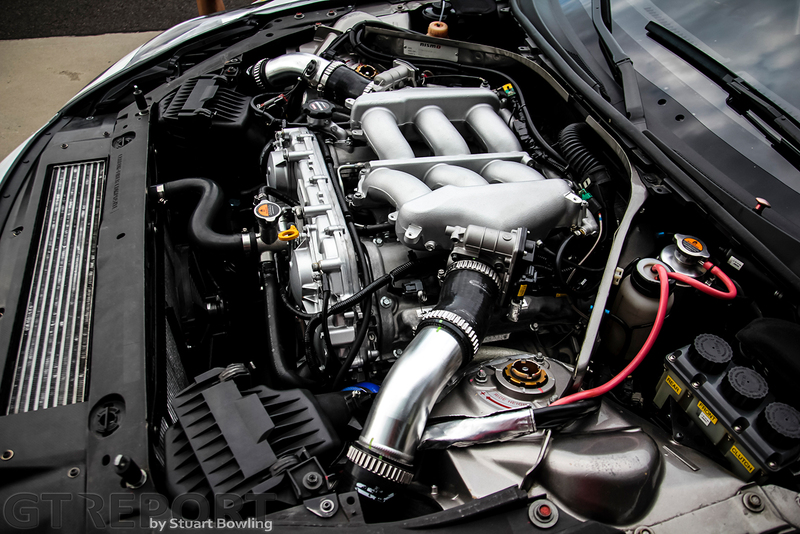 Remarkably for the 2012-2014 models, the turbochargers used are still the road going IHI items, albeit with revised internals for durability under the stresses of racing. For 2015 onwards the GT-R GT3 benefited from the homologation of the GT-R Nismo road car to replace these with new hi-flow units. 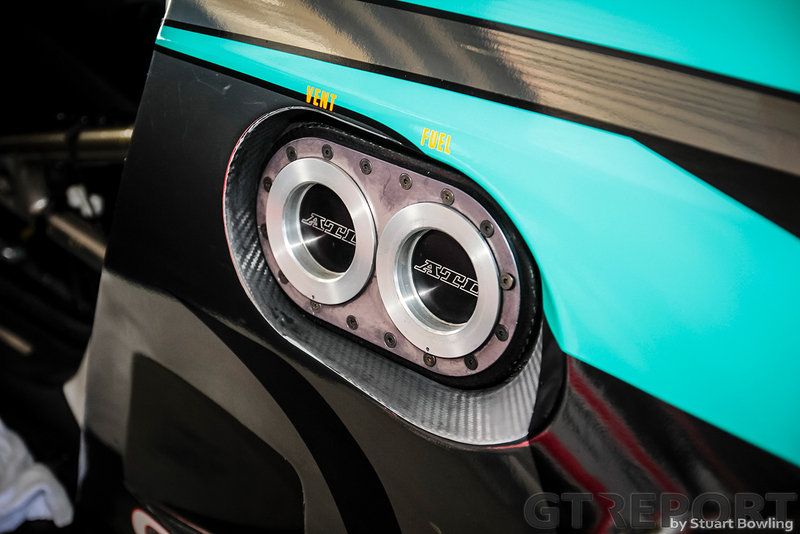 With the GT3 regulated Balance of Performance applied, a GT-R GT3 can typically be expected to put down around 550 bhp @ 6.400 RPM, and provide 650 Nm of torque at 4.000 RPM. 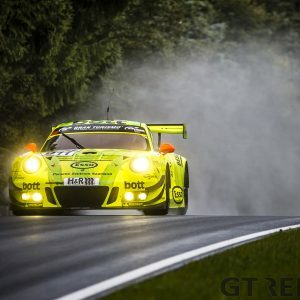 This motivation is all put out via the rear wheels only – the 4WD of the road car is removed to comply with the GT3 rules. Such performance comes at the expense of life span however, with Nissan’s quoted figures of a full rebuild at 9.000 km and full replacement at 18.000 km, although sources have quoted less than these. Unlike the road going car, the GT-R GT3 engine is served by a dual exhaust system which is split evenly left and right. Each branch of exhaust extends from the engine and turbos down behind the front tyre where the catalytic convertors are located. From here the exhaust turns 90° and runs through the side skirts before exiting out the cars side about its middle. To keep the engine humming along reliably, the GT3 has a specialised cooling package within its large front bumper intake that is split to serve various tasks. The top most part of the air intake feeds an oil cooler which is mounted within an original spec carbon composite cross support. The central part of the intake – which is extended by cutaways made in the original cars front cowling – provides air to the main radiator which is also fan assisted for slow airflow conditions. At either end of the aforementioned front cowling are more cutaways housing the intakes for the engine itself. Finally, the lowest section of the grille supplies air to the turbo intercoolers in its middle, with intakes for the front brake cooling placed either side. 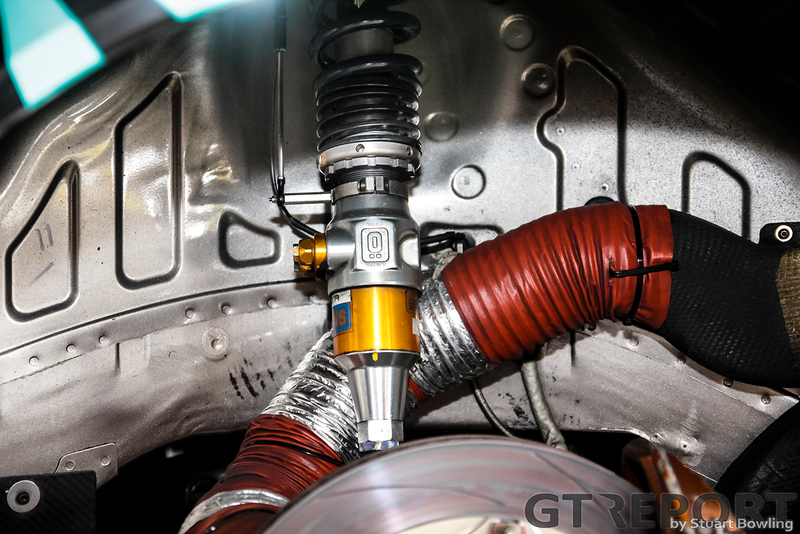 One of the most significant changes made to the GT-R’s mechanicals is the transmission. In place of the road going cog-box is a race-specific Hewland 6-speed pneumatically controlled unit for providing quick and precise shifts to cut down lap times. This unit is placed on the car’s transaxle to help optimise weight distribution to as close to 50/50 as possible. Its rebuild interval is quoted at 5.000 km. The cooling for the transmission is provided by an oil cooler in the boot space, fed by a cleverly mounted duct placed at the top of the cars boot lid which pulls in airflow from the stream travelling over the cabin. One of the key challenges facing JRM when designing the GT-R GT3 was enhancing its aerodynamic performance to keep pace with its rivals. To hone the GT-R into a balanced package and prevent it from being purely horsepower and torque reliant for lap times, an extreme suite of aerodynamic parts is applied. At the very front of the car juts out an enormous carbon fibre front splitter. This is the GT-R’s first point of contact with the air and it “splits” its flow across the front of the car to prevent stalled air on its top side disturbing the path of high speed air that is forced underneath. A very slight, raised curvature is applied in the centre of the splitter lip to create a small tunnel to increase the volume of air fed under the car. 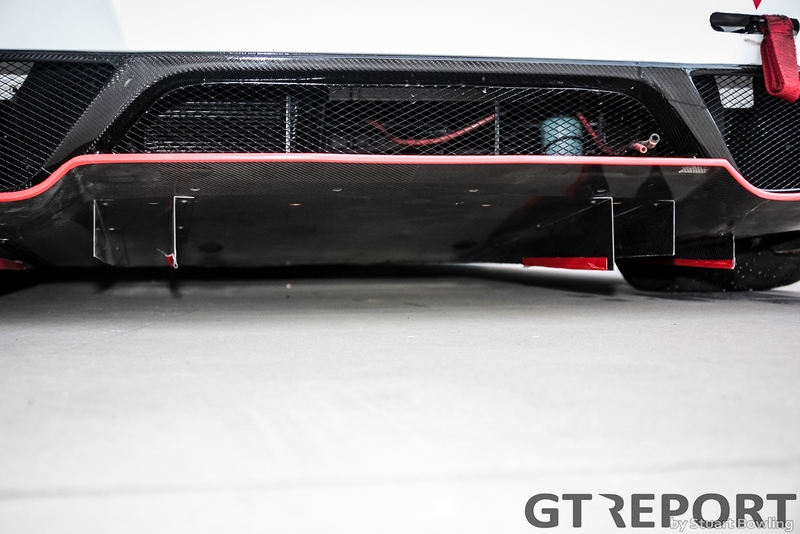 Once underneath, air flows at high speed between a fully flat floor and the road surface creating low pressure and therefore suction and grip, before it is finally dispelled through a six-strake rear diffuser and expands back to higher pressures. The slower air trapped on the upper side of the splitter feeds the cooling requirements of the car and is fed back into streamlined flow via numerous vents on the bonnet. To further reduce the amount of air spoiling the under floor of the car, the GT-R has very large and imposing side skirts. These do more than just house the exhaust; they act like a front splitter by trapping slow air against the side of the car to keep it separated from the faster air going underneath it. 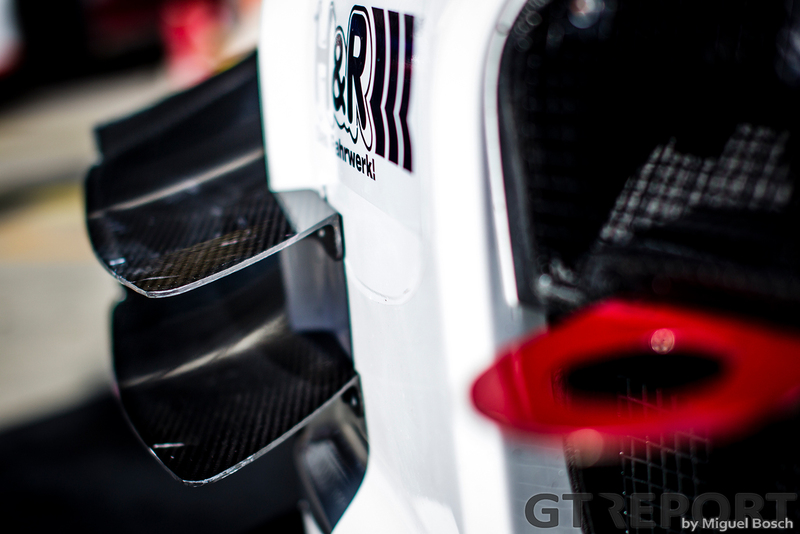 On the corners of the car’s front bumper are carbon fibre dive planes, with a pair either side. These are massive compared to other competitors and are incorporated to provide extra downforce for the front of the car, as well as direct airflow higher up along the side of the car to minimise its disturbance to the floor section. Interestingly, the first iteration of the car (2012) had no dive planes at all; these were added in 2013. The shape of these original planes remained until they were revised in 2015 for better performance. Spinning wheels and tyres create significant air turbulence which can spill out of the wheel arches, disturbing flow. 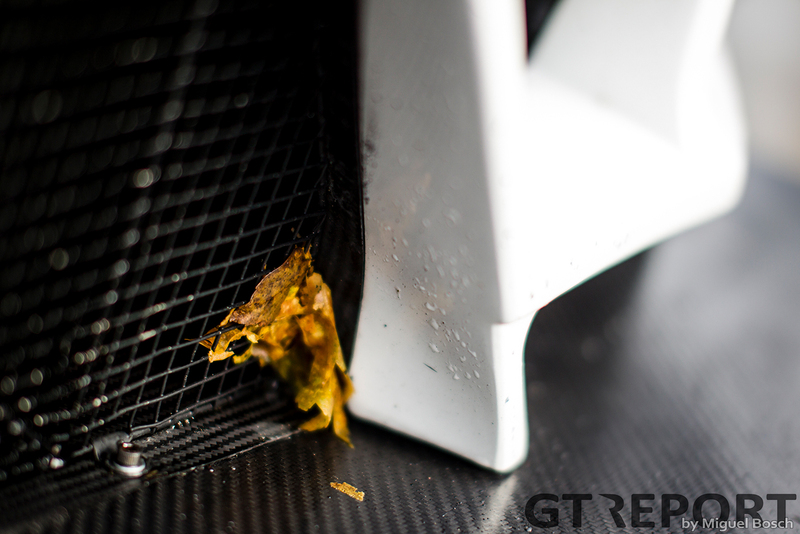 To control this, the GT-R GT3 features a set of front quarter panel vents. The items on the 2015+ car appears to have shrunk by almost 50-percent when compared to the size of the 2012-2014 models. 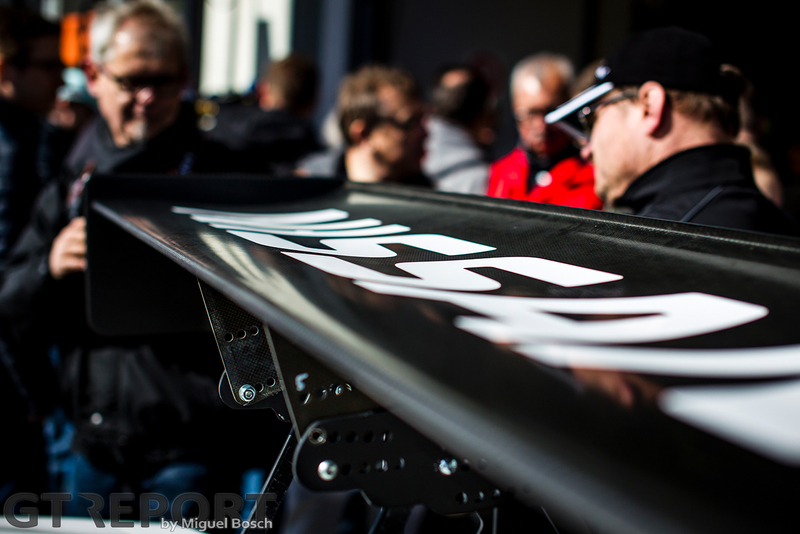 At the very rear of the car is a GT3 spec rear wing; and it really is a behemoth! Almost the full width of the car even with its pumped-out wheel arches, it features a single, straight chord design of carbon fibre goodness. 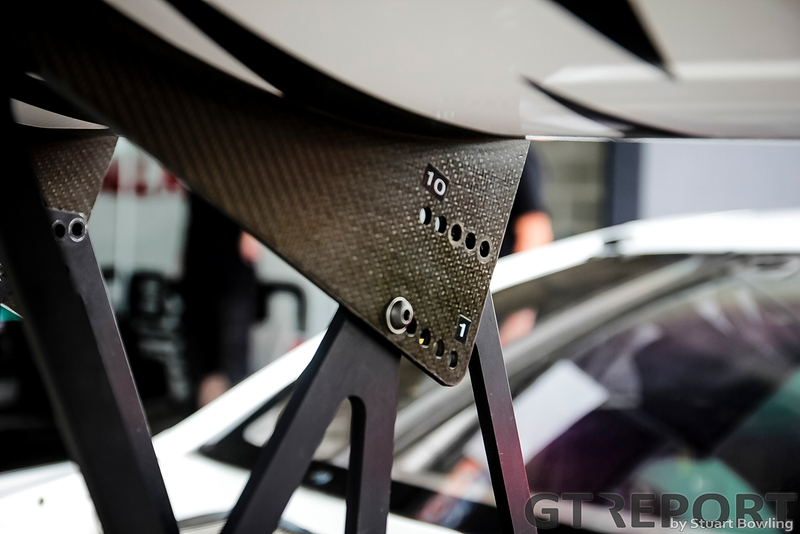 Full carbon endplates are sported both ends and are fixed without adjustment. 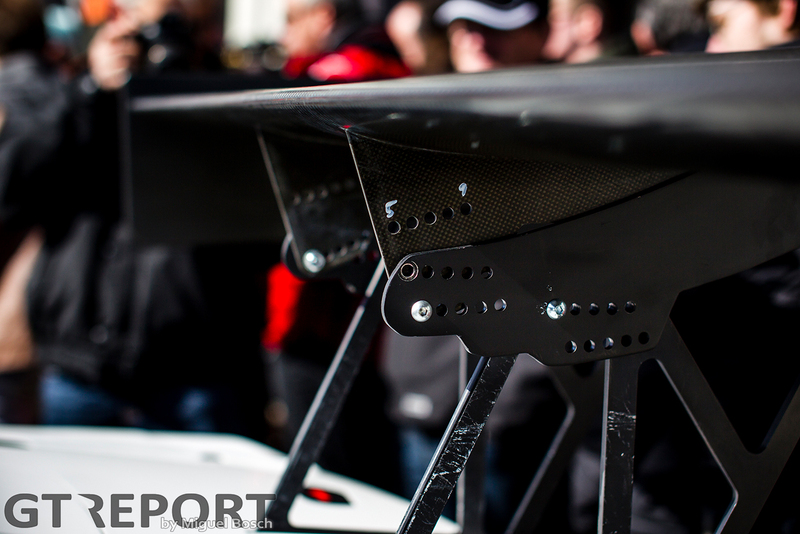 The wing is propped up on very tall mounts that are made from milled aluminium. This places it very high into clear air for optimal downforce contribution. Wing adjustment is performed at the mounting connection to the wing itself. 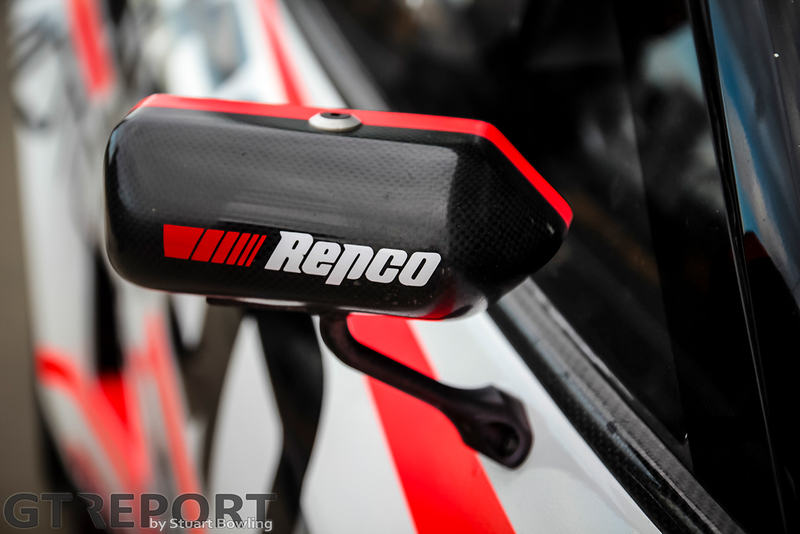 Even the side mirrors of the cars have also been given the aerodynamic treatment for reduced surface area and drag, with a face area reduction to the FIA mandated 100 mm² minimum mirror area. 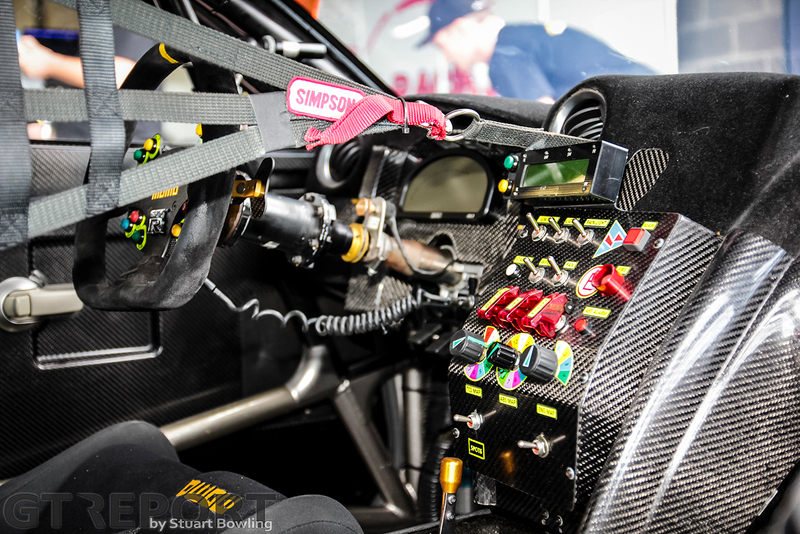 As previously mentioned, very little of the GT-R road car interior is retained in the GT3. Only the form of the dashboard remains as it is replaced with a full carbon fibre. The GT-R’s famous comprehensive multi-function display in the centre of the dash is also lost in the weight cull. A void that on the road car would be the passenger glove box now houses the race car’s ECU (a Pectel SQ6M unit). The GT-R’s dash controls are whittled down to the bare minimum. As was the GT3 style of the time, some of the more advanced functions and controls are located on a raised carbon centre control panel. On the 2015+ models, this console is raised even further to bring the controls closer to the driver – which most likely was done to benefit the pint-sized Katsumasa Chiyo! On this centre panel the driver will find dials to fidget with the ABS (12 settings), traction control (eight settings), brake bias controller and four boost maps. There are also sets of rocket switches for activating safety features and air conditioning. Most of the other controls for the car are right at the fingertips of the driver on the steering wheel. For 2012-2014 the wheel in question is an alloy hub Sparco item with ten buttons, five each side. These control items such as the drink dispenser, radio, lights, pit limiter, etc. On the 2015 update, the steering wheel was the target of further aggressive weight loss goals and became a full carbon unit with flat bottom. All the GT-R’s critical race metrics are displayed to the driver via a Motec ADL3 Dash system. The pedal set of the car is an AP racing unit sitting on an adjustable pedal box, with the master cylinder arrangement tucked in behind. 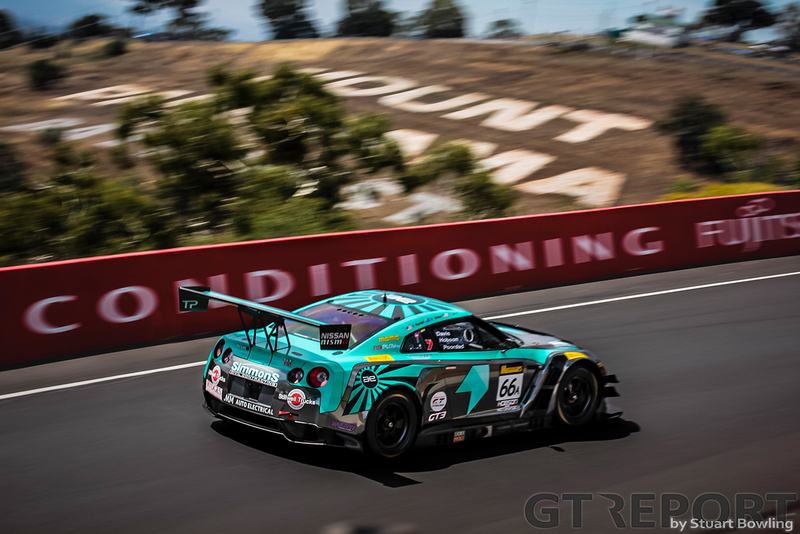 In the blazing heat of the Bathurst summer where outdoor temperatures can regularly reach 40°C, the GT-R’s cabin A/C is not strong enough to maintain the 10°C difference to ambient temperature required by the FIA. To ensure the driver is kept comfortable, a dry ice-based cool suit system is typically employed. This is a free choice for the operator and not standard kit from Nissan. The A/C systems itself can be tailored to suit the conditions. 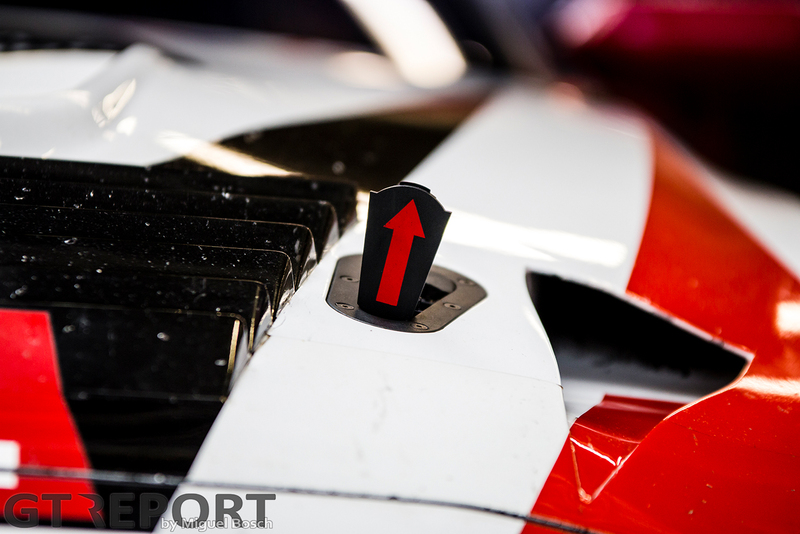 The 2014 model factory entry from the 2015 B12hr featured plumbed seat vents, an adjustable front of body vent and a helmet plumbing system to vent cooled air directly to the driver’s head. Tucked behind the driver is a 130 litre ATL fuel cell, which is fed from a special inlet located on either side, just behind the doors. This inlet can be swapped over depending on pit configuration, as can the air lance for operating the on-board jacks. The fuel inlet incorporates both a supply and vent pipe arrangement, removing the need for a separate vent pipe handler during stops. 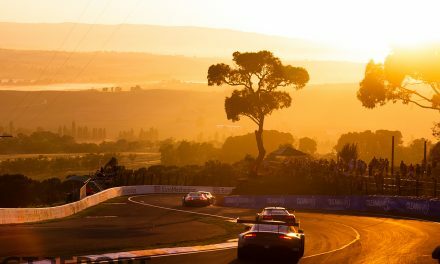 The 2017 Bathurst 12 Hour would prove to be an eventful one for both Nissan teams. For Brett and Laura Hobson – owners of Hobson Motorsport – their weekend could best be described as hectic. Observing their B12hr experience was like watching a masterclass in juggling tasks. Despite Brett performing lead driving duties for the number 66 car, co-driven by Always Evolving’s Eric Davis and American Am driver Fred Poordad, and Laura managing the team’s media and cheque book (racing is expensive); both played equal part in hosting the team’s unique fan activations as well as entertaining a stream of media commitments. Judging from the smiling faces leaving their garage they must have put on a great tour – remarkable given the added stress of managing unexpected mechanical issues, organising urgent parts procurement and pouring over the numbers during some back of pit-bay accounting. 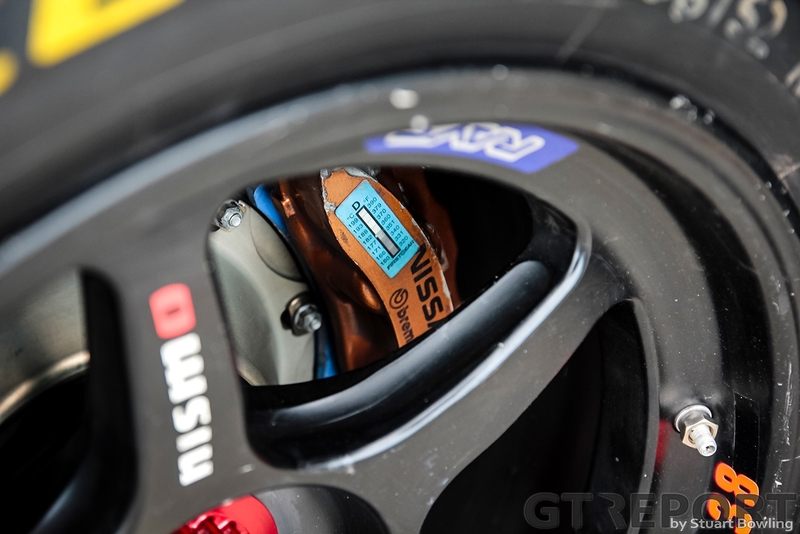 The first trial of any GT-R GT3 over the weekend occurred early on the Thursday set-up day in their garage before any running was completed, when the number 66 car sprung a last-minute clutch issue requiring an extensive repair. 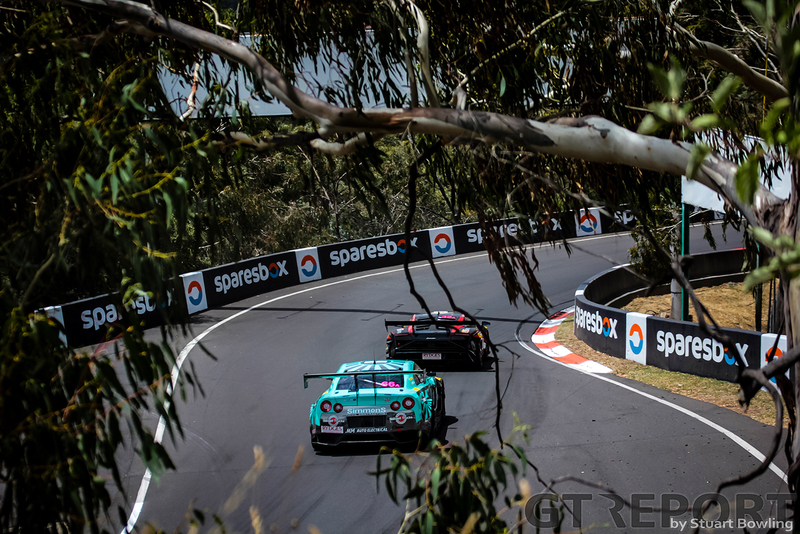 After a significant amount of hurried spanner swinging by the Wall Racing crew, the car was ready to run alongside the number 38 entry driven by Chris Pither, Daniel Bilski and Adrian Flack for the weekend’s action. 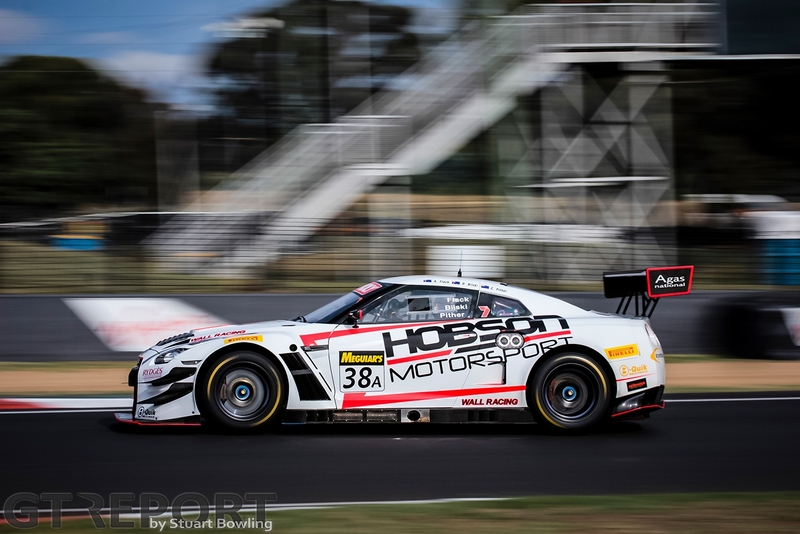 But Hobson’s early issues were simple compared to the experience of the Nissan Australia factory team. 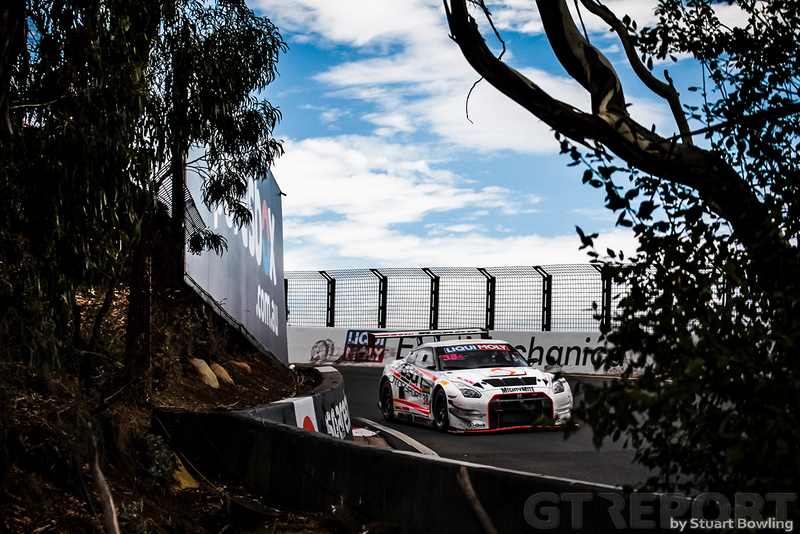 On the Friday, GT-R fans were given some significant things to worry about when the number 24 factory team car (Jann Mardenborough, Florian Strauss and Todd Kelly) nosed into a wall at the top of the mountain with GT Academy graduate Strauss at the wheel. The impact on the right side of the car was hard enough to bend the car significantly and many feared it was done for the weekend. A long night was spent with the local body shop jig, straightening the chassis out for its return mid-Saturday. Shortly after the number 24 entry returned to the track, the factory Nissan mechanics were very quickly tested once again when Chiyo clipped a wall with the front right tyre of the number 23 car (co-driven by Alex Buncombe and Michael Caruso), tearing the front wheel assembly from the car. It was not enough to rule the car from participating on the Sunday but held it out of qualifying. 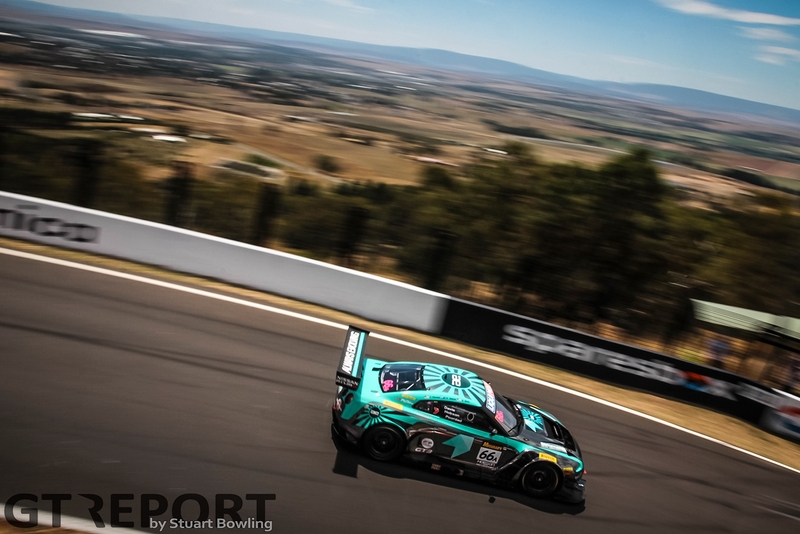 Come race day, a record four GT-Rs took the start of the Liqui Moly Bathurst 12 Hour, their distinctive drone like hum filling the darkness before their squarish silhouettes began being exposed by the first rays of the day’s sun. 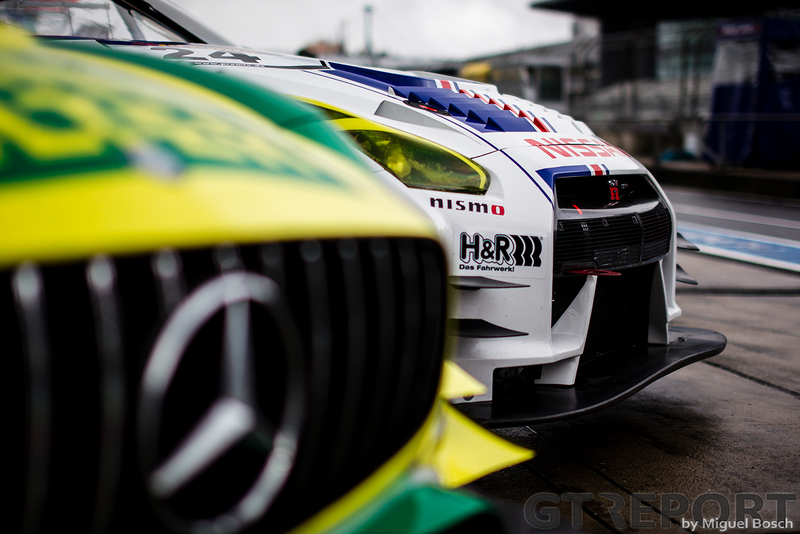 The morning events went in differing directions for all the entered GT-R’s. For the factory team, the number 23 entry lost bags of laps early with a gearbox issue, whilst in contrast the number 24 car would gain the race lead in the early running. For Hobson, the number 66 car ran nice and cleanly for numerous hours, whilst the number 38 entry was forced to make a gap where there wasn’t any between the crashed number 74 Jamec Pem Audi and the wall at The Dipper in near darkness about 15 minutes into the race, resulting in serious damage. It would eventually return but its race was already significantly hindered. Then all the luck ran out. 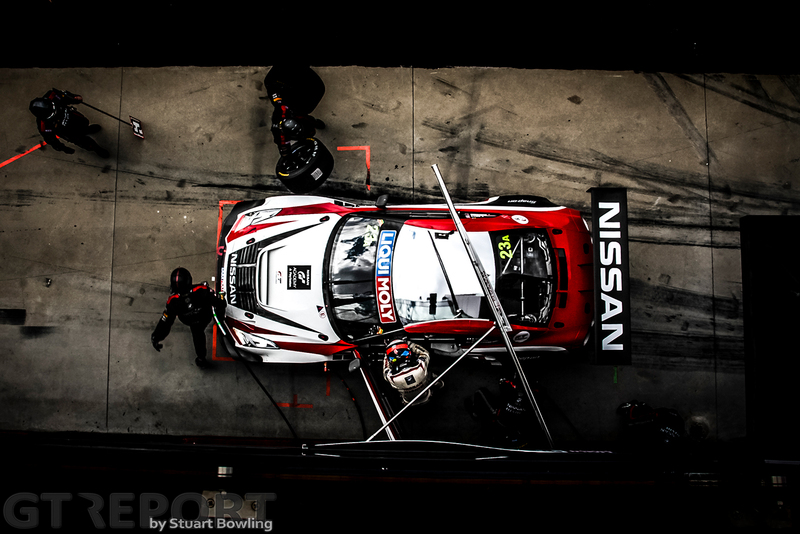 For Nissan Australia, the number 24 entries gearbox decided to become faulty and ultimately forced it to drop right off the lead lap – finishing in eighth place. Meanwhile, the number 23 car had returned to the track but couldn’t seem to stay out for any reasonable length of time, finally finishing the last of the runners in 32nd place. A few doors down, the Nissan presence had its most cruel moment of the weekend late in the afternoon when the number 66 car crashed out after multiple heavy hits with the wall at The Esses and The Dipper with Poordad at the wheel – the last of which was a head-on collision. That impact knocked the wind out of Poordad and required him to stay at the local hospital for a few days. Meanwhile, the number 38 Hobson GT-R had enjoyed a much cleaner run to the flag, logging a 31st placed finish. When I last saw the Hobsons, they had just received the 66 car back in Parc Fermé and were going over the extensive damage. It was a saddening sight to see some genuinely nice privateers looking worryingly over one of their prized possessions. Racing is a cruel mistress. The GT-R GT3 was alone in flying the flag for Japan in GT3 competition worldwide until the recent arrival of Honda (NSX) and Lexus (RC-F). Now in its fifth year of operation, the car has earned a strong support base based off its cult-car status. But GT3 moves fast. 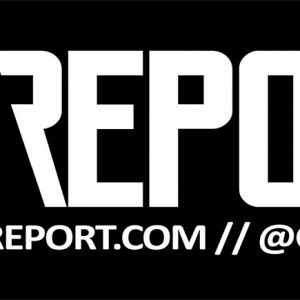 The 2016 raft of new cars built to a revised regulation has left the GT-R trailing in terms of sophistication and build specification. To counter this, Nissan and JRM are developing a heavily revised car for the 2018 season to carry on fighting until the next generation of GT-R appears sometime around 2020. 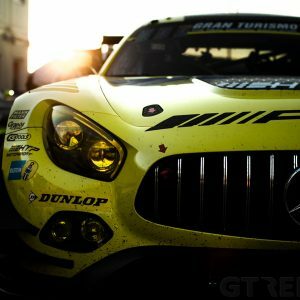 With the level of extreme alteration already done from 2012 to today, there is no doubt this next evolution will likely set a new benchmark in GT3 builds. Stuart is a fan of racing on four wheels as well as two. He was bitten by the sportscar bug as a kid in the 90's, which inspired him to become a mechanical engineer. He enjoys studying the craft and design behind the top racing machinery, heading to the track, and tinkering in the garage where he usually has something going on.